This interview is one that we all need to listen to. Whether you are in the early stages of contemplating how you want to live your life as you move into your second stage, or whether you have a parents who are now in their later years, Dr. Kerry Burnight discusses many of the important topics that often go unaddressed due to our faulty relationship with aging. A big ah ha moment for Dr. Burnight was when she asked a group of fourth graders “what happens to us when we get older?” and the response was “you get ugly.” Recognizing that there was much work to do, Dr. Burnight has made it her mission to redefine what aging looks and feels like. Dr. Kerry likes the term pro-aging, as anti-aging sets the tone for us holding onto the past. She encourages us to age brilliantly, beautifully and on our own terms. It is when we can accept and be thankful for what is versus what was, that the beauty opens up. Aging well is about being the best you that you can be, where you are and at the age you are today. We talk about some of the “false truths” that come with getting older and it is only when we talk about dying that we can live our life to the fullest. Dr. Kerry talks about first imagining yourself as an older version of yourself. Who would you be with? Who do you want to be? What type of life do you want to live? She encourages us to think about someone we know, who is older and who we respect. What are they doing well that we can replicate? 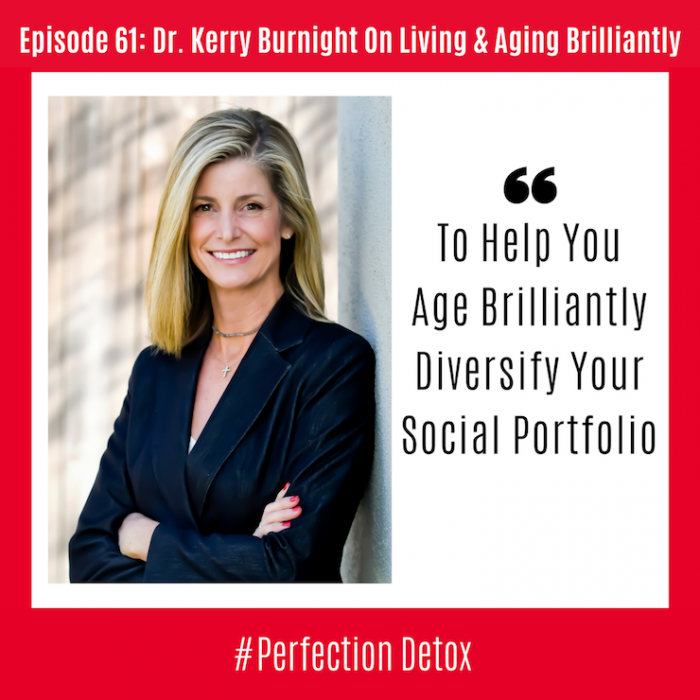 Dr. Kerry also talks about the importance of diversifying our social portfolio, so that we have people in our inner circle who are both younger and older and live both near and far away. Dr. Kerry shares the importance of removing as many poofs as possible. POF – Points Of Frustration. and as our loved ones age and as we get older, how can we design our life to keep our enjoyment while limiting our frustrations as time passes. In this interview we talk about the challenges that can come when dealing with loved ones. Dr. Kerry encourages us all to be mindful of how we speak to our elders. Just like us, they are looking for autonomy, dignity and respect. She gives many simple tips that we can use immediately – one being to speak in lower tones as the first thing to go with our hearing is the higher pitch tones. She invites us to consider that perhaps our loved ones do not have hearing problems, but rather we have speaking problems. She also gives us tips and strategies to make sure our elders are protected whenever they are online or on the phone. A wonderful conversation to help us all age brilliantly. Dr. Burnight served as a Professor of Geriatric Medicine and Gerontology at the University of California, Irvine for 17 years. She is also the Co-Founder and Director of the nation’s first Elder Abuse Forensic Center, where she wrestles with the county’s most difficult cases of elder abuse, neglect, and exploitation. Her mission is to tackle Senior loneliness and how we have to honor and pay attention to our seniors because feeling disconnected and lonely is actually a health risk and taking lives. As a top expert in the nation on aging, she has shared her work at the White House, Money Matters, the Doctors, CBS news, and the Dr. Phil Show. Passionate about improving the lives of millions of seniors, Dr. Burnight joined Silicon Valley engineers to create a cutting edge solution to the toughest problems we face as we age. She serves full time as Chief Gerontologist at grandPad.